You’re probably familiar with any number of sales team tools. 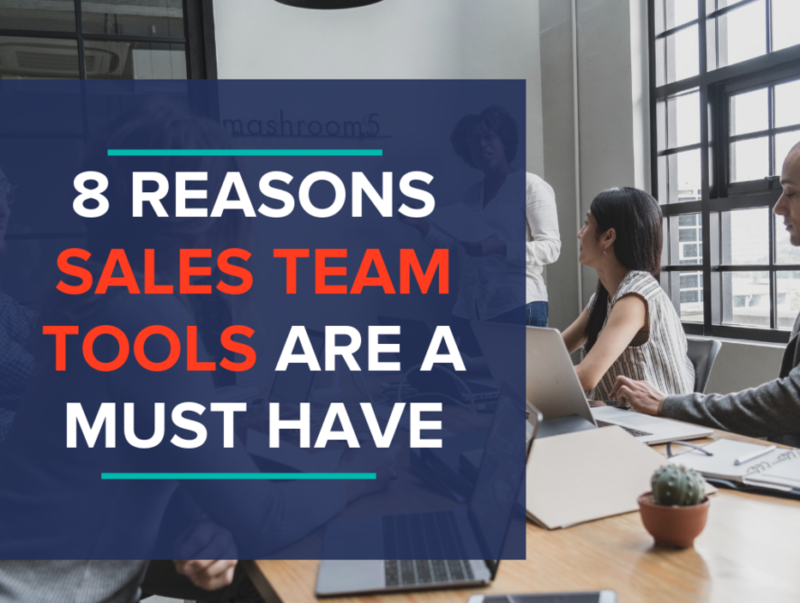 With the innumerable options out there, you might wonder, is the use of these “must-have sales team tools” really critical to success? Your sales organization needs to be ahead of the innovation curve in order to compete. Failing to give sales reps the right resources makes their job more difficult, and their results- or lack there of- reduces sales closed and revenue earned. An August SalesTechReport by CITE Research and Sugar CRM surveyed 400 sales executives, and found that majority of them rely on an average of 11 sales tools. And with good reason: according to DemandGenReport, nurtured leads produce, on average, 20% more business opportunities than non-nurtured leads. Sales tools nurture leads, therefore sales tools increase business opportunities. Snippets and templates…and so much more! Track Customer Life-Cycle: Customers are a priority and ultimately without their engagement sales would cease to exist. It’s crucial to know potential and current customer’s activity history and connections. Salesforce customers see a 37% jump in sales revenue because of the ability to track and manage contacts from lead to customer. This sales team tool allows businesses to personalize pitches and give sales the information they need for a precise follow-up. Here at Winmo, we recognize just how integral SalesForce is to a new business rep. That’s why we have a seamless Salesforce integration within our platform. Build a More Connected World with Organization of Commands and Tasks: What business wouldn’t want to save time and reduce stress? Through If This Then That (IFTTT), you can create chains of social media changes. When one platform updates, IFTTT can post the same content on multiple social outlets. This tool can be used daily by each department within a business. With the use of an organizational task tool, less time will be spent distracted and more time can be spent focusing on selling. Lead Intelligence produces all relevant information for a lead such as time zone information, activity history and personality disposition right before your sales team takes action. Activity History provides customer-specific insights on all activity and the best steps to take next. Persona Insights make life easier by providing the best email and call times to make your efforts most effective. Sales Leaderboards make healthy competition possible on every team. Who’s on top this month? A weekly report on web traffic, CEO approval ratings, and so much more. All in all, obtaining information on companies you care about is a must, and keeping up with your competition will motivate you to continue to CRUSH them. Training effectiveness within the content library that include web presentations and interactive content and track how sales reps consume and engage with this content. Replicate best practices allows sales reps to keep track of their own results and compare and share them with others as well. Coach for success provides focuses on what it takes to deliver a successful presentation and create positive customer reactions. Get the right contacts at precisely the right time: Find a tool that helps you connect, engage and close more business. A solid database can create so many prospecting opportunities and help you own the leadership board. Although we may be a little biased, Winmo gives you key decision-makers budget by budget, projected opportunity timelines, and lets you know when to pitch, who to talk to and how to win more business. At the end of the day, we appreciate that the sales process takes time – and time isn’t cheap. And with so many sales team tools worthy of your time and money, don’t hesitate to take advantage of free trials or product demos. Bigger and better success is possible if you maximize productivity and resources with the many options available to you, so fire up those tools and close, close, close!